Brandon Ofiana finds a medium to express his passion for soccer through KCR. Photo by Sumner Shorey. Soccer fans rejoice! KCR’s very own Alejandro Villasenor and Brandon Ofiana have a show dedicated to what you love. “Footy Aztec” is the soccer focused radio show hosted by Alejandro and Brandon every Sunday at 6 p.m. According to Alejandro, the two focus on Aztec soccer during its season: the fall. Brandon added that European soccer is extensively covered on air as well, more so in the spring when the Aztecs aren’t playing. Last semester, the show featured an on-air interview with SDSU men’s soccer captain Sergio Enriquez. 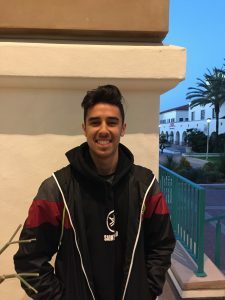 Alejandro, a communications major, has covered soccer on his show since he joined KCR at the beginning of his freshman year, three semesters ago. He said that from a young age, he had his sights set on a sports broadcasting career. He dreams of one day covering a World Cup. “KCR is a good stepping stone,” said Alejandro when discussing sportscasting opportunities. Alejandro Villasenor has been an active member of KCR for four semesters now. Photo by Alejandro Villasenor. Brandon, a journalism major, expressed a similar interest in sports broadcasting. Having played soccer all his life, his passion drove him to the potential career route. While co-hosting the show, Brandon plays soccer through SDSU’s on-campus intramural league. Brandon told me that the UEFA Champions League is a major focus of “Footy Aztec.” Alejandro added that it takes up over half of the hour. The two discuss their predictions, analyze teams, cover past matches, report injuries and give the low-down on team news during the show. I asked the hosts if they had any plans or goals for their program and I got some ambitious answers. Alejandro hopes to get in contact with Aztec soccer to set up broadcasts for home games, similar to KCR’s coverage of Aztec baseball games. Expanding KCR’s sports broadcasting lineup would likely be welcomed by many. Adding to their goals, Brandon and Alejandro expressed interest in airing “Footy Aztec” on another medium: either Facebook Live or YouTube. A weekly edition of the show uploaded to a YouTube channel also seems like an option. Brandon noted that he enjoys being able to talk soccer for an hour every week with a friend. Alejandro added that he gets a similar kick out of hosting the show and being able to share and hear opinions. 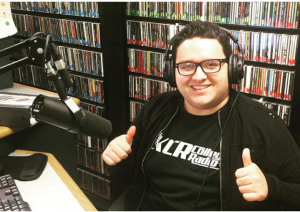 If you want to listen to Brandon’s and Alejandro’s show, “Footy Aztec,” tune into KCR College Radio on Sundays from 6 to 7 p.m.